The New England Aquarium in downtown Boston is built around a 4-story, 200,000-gallon Giant Ocean Tank. 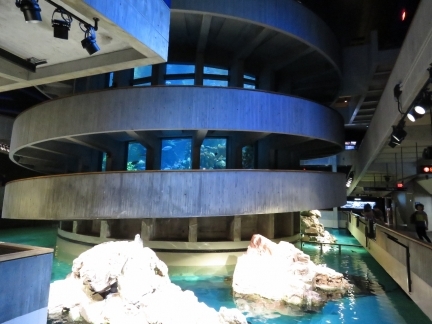 A wrap-around ramp, with viewing windows along the way, leads up and around the tank to exhibits on other floors that range from penguins to octopus to jellyfish. 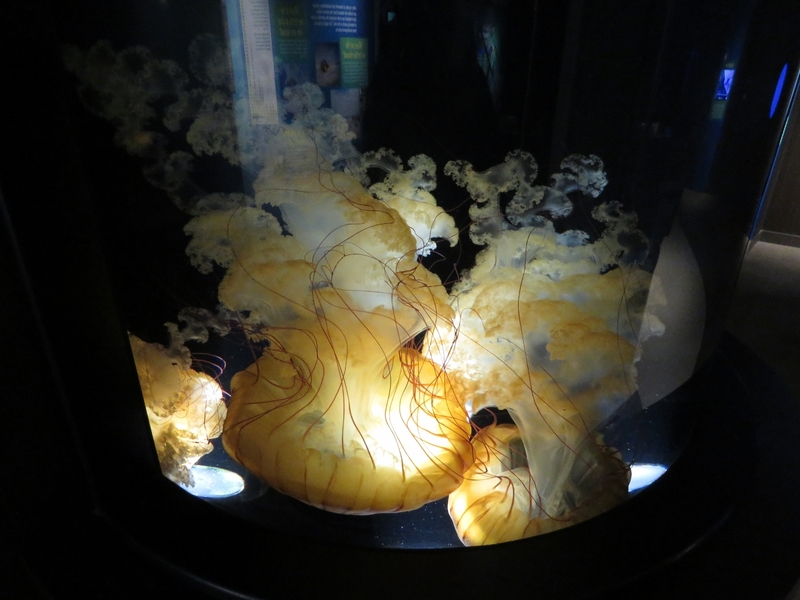 We spent a full day at the aquarium, enjoying the exhibits, taking a behind-the-scenes tour, and watching two ocean-themed IMAX films. 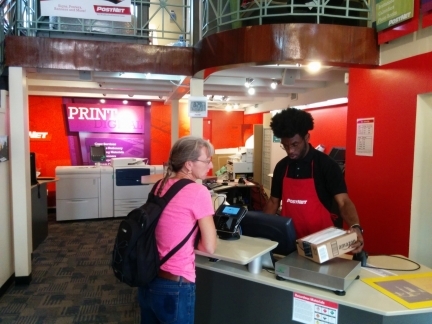 At PostNet to return the failed satellite data modem and unused LNB to KVH and to mail another small package. 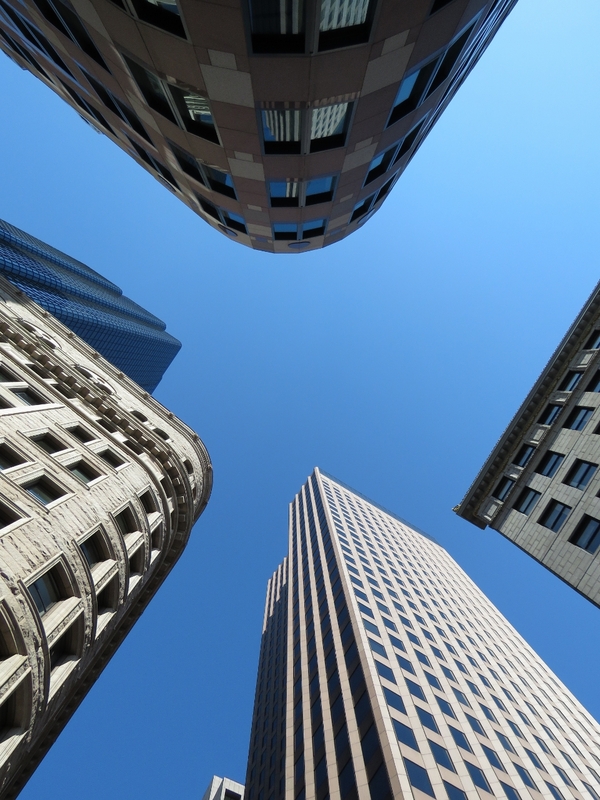 A mix of old and new building looking up at the corner of Kilby and Exchange streets. The Old State House, built in 1713, housed the colony’s government. 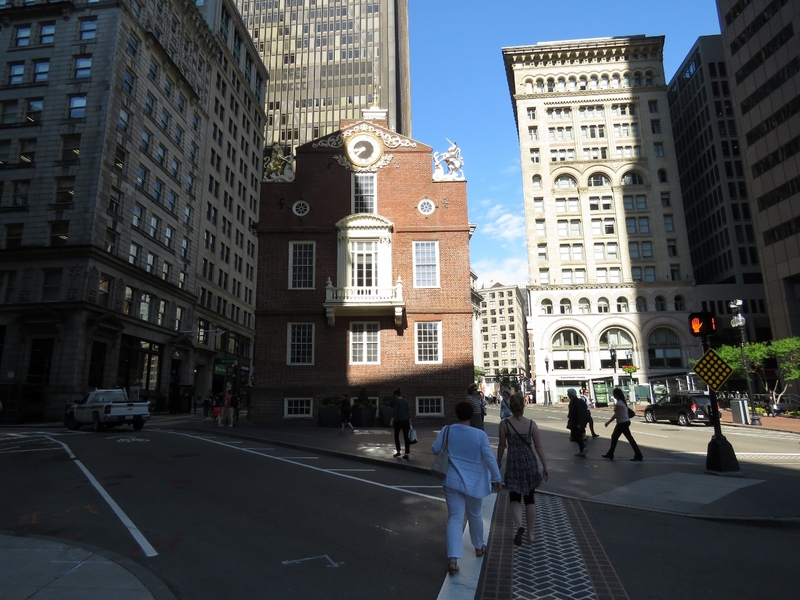 A number of key events in the American Revolution occurred here, including the first public reading of the Declaration of Independence from the State House’s balcony in 1776. 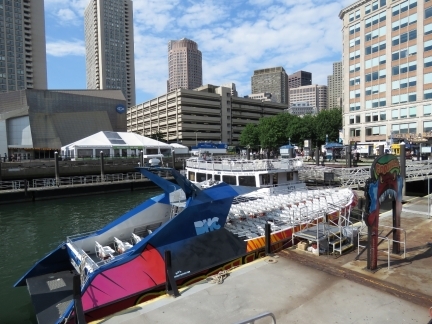 Picking up a Boston Transit “Charlie Card” to use on the transit system. 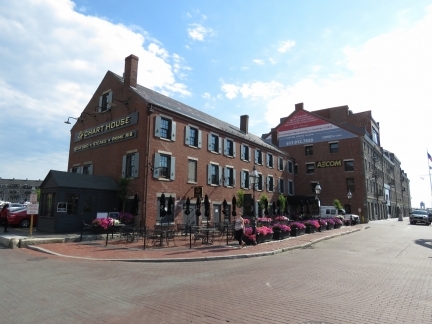 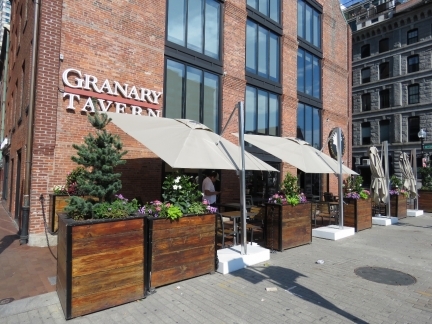 Downtown Boston has a lot of excellent-looking pubs and restaurants. The Circle of Animals/Zodiac Heads is the first public sculpture project by internationally acclaimed Chinese contemporary artist Ai Weiwei. 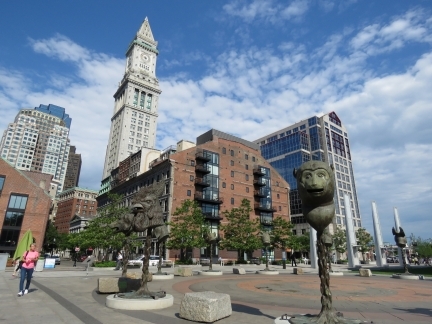 The bronze animal heads represent the twelve signs of the Chinese zodiac and is here on the Rose Kennedy Greenway as part of a multi-year global tour. The high-speed tourist boat Codzilla, that we saw when first entering Boston Harbor, moored at the Boston Harbor Cruises dock. 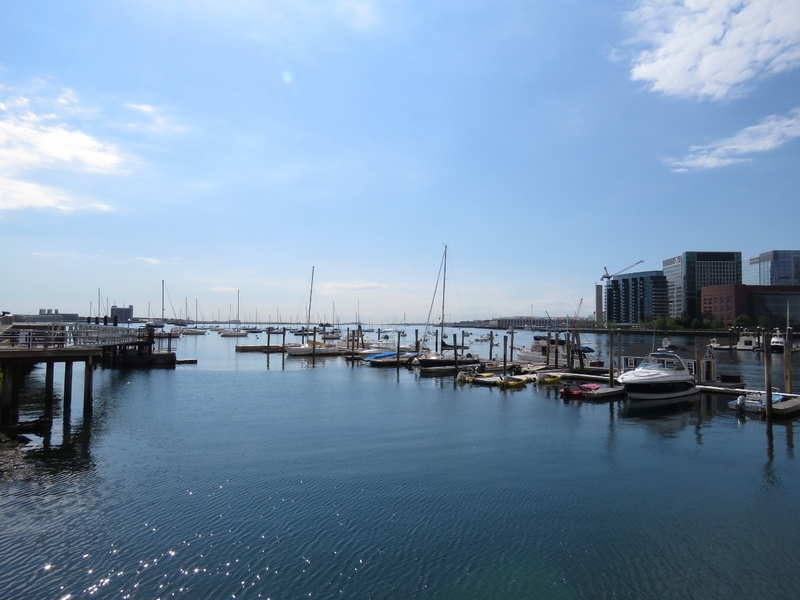 Looking into Boston Harbor across India Wharf. 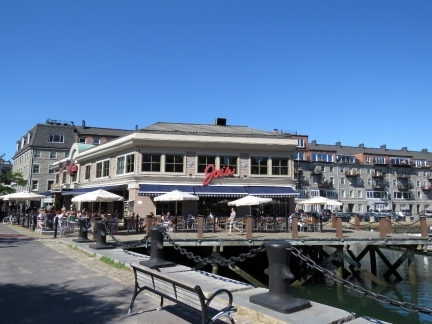 The now-demolished original wharf, built in 1803, was once one of the largest commercial wharves in the port of Boston. On the ground floor at the New England Aquarium. 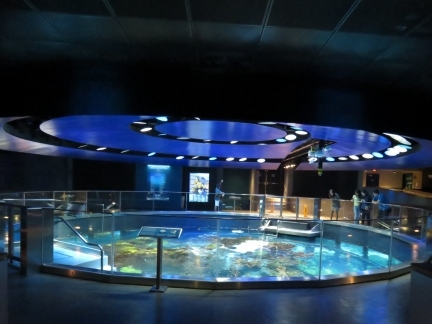 The view is looking across the penguin exhibit to the 4-story, 200,000-gallon Giant Ocean Tank that anchors the aquarium. A wrap-around ramp leads up and around the tank to the exhibits on other floors, with viewing windows into the tank all along the walkway. 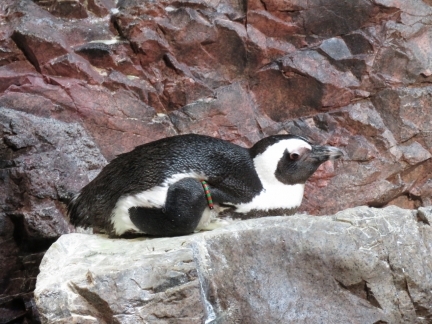 An African Penguin at the New England Aquarium. Also called the Jackass Penguin due to their donkey-like braying sound, these are the same species of penguin at the Stoney Point Penguin Colony we visited in the wild in South Africa. 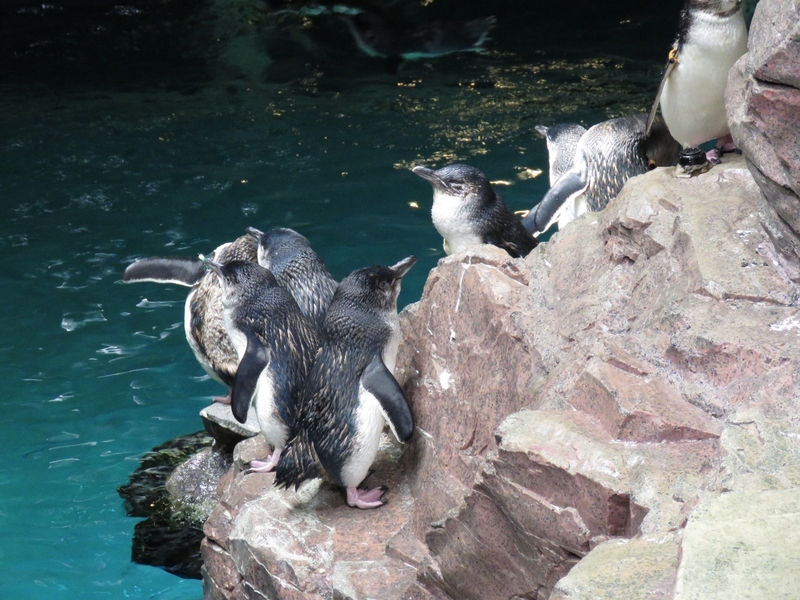 We’d arrived during penguin feeding time at the zoo. The keepers carefully record what each penguin has eaten and ensure they all get some fish. Little Blue Penguins waiting for food. 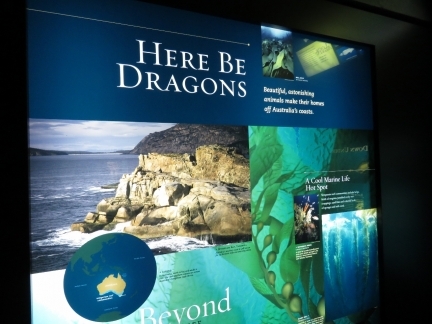 We saw a couple of these in Steward Island, New Zealand. The Southern Rockhopper penguin breeds on rugged, rocky islands located in the sub-Antarctic and south temperate regions of the Indian and South Atlantic Oceans. 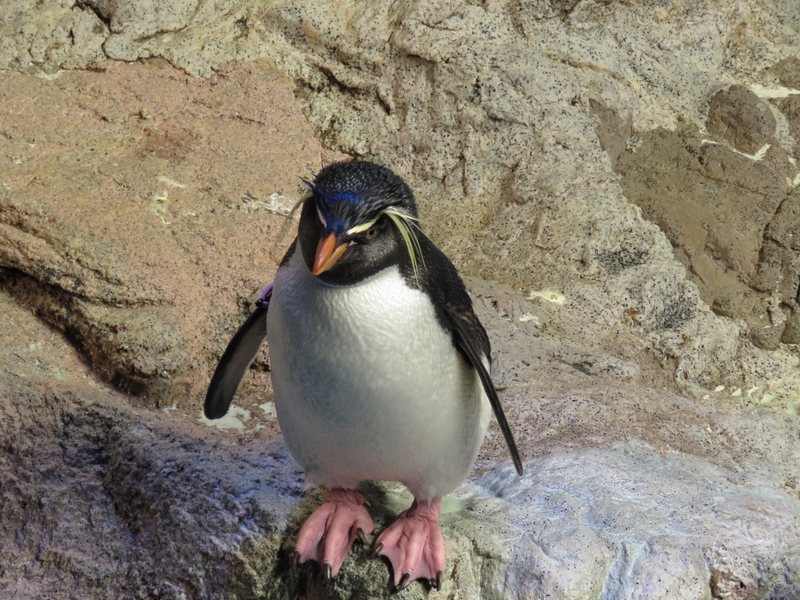 They look similar to the Fiordland Crested Penguin we saw in Fiordland. 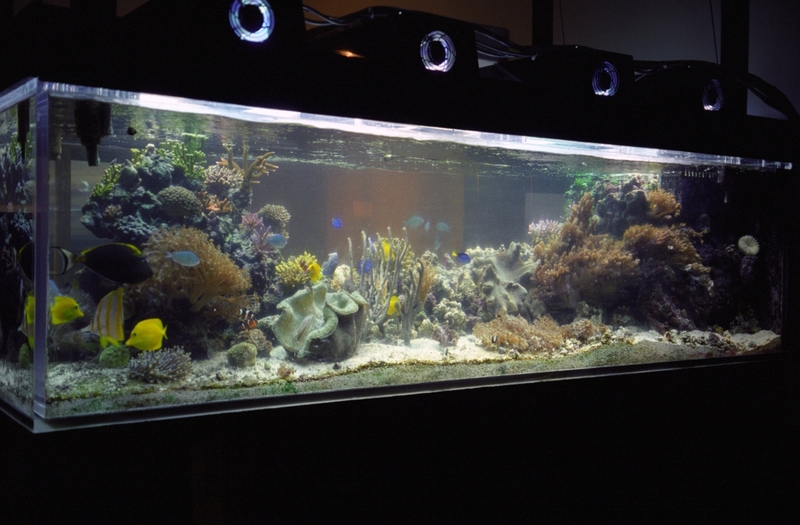 The Pacific Reef tank reminded us of the 600-gallon reef tank we kept at our old house in Seattle. We even had a giant clam in about the same location. 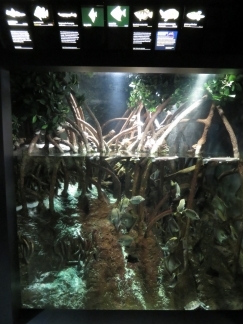 Looking through one of the viewing windows into the Giant Ocean Tank as we walked between levels. 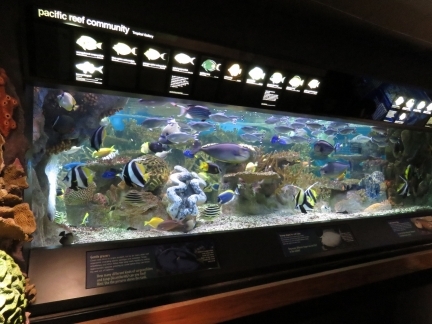 The tank is spectacular and packed with more than a thousand animals. 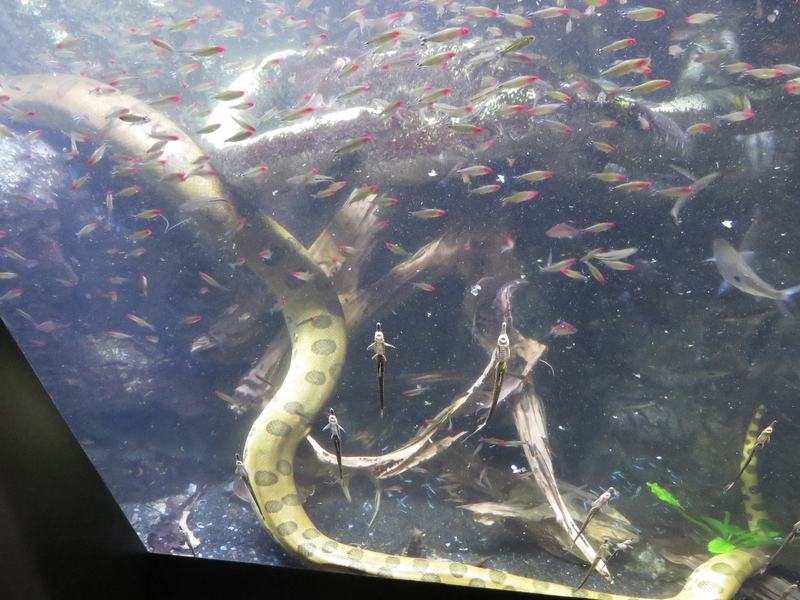 They’re all well-fed so the larger animals don’t usually prey on the smaller ones. 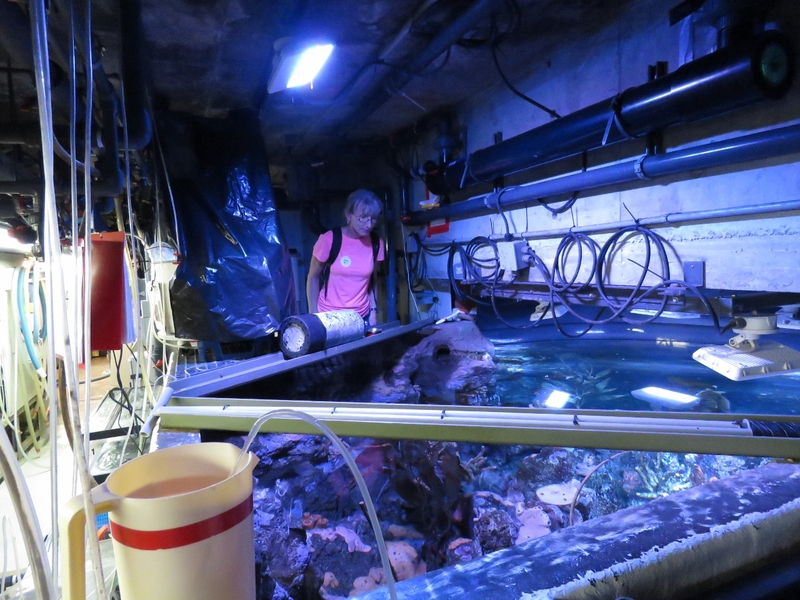 The star of the Giant Ocean Tank is Myrtle, a giant green sea turtle that weighs over 500 pounds and is estimated to be 80 years old. 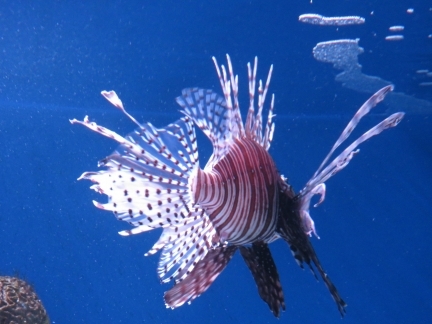 A spectacular, but venomous Lionfish. 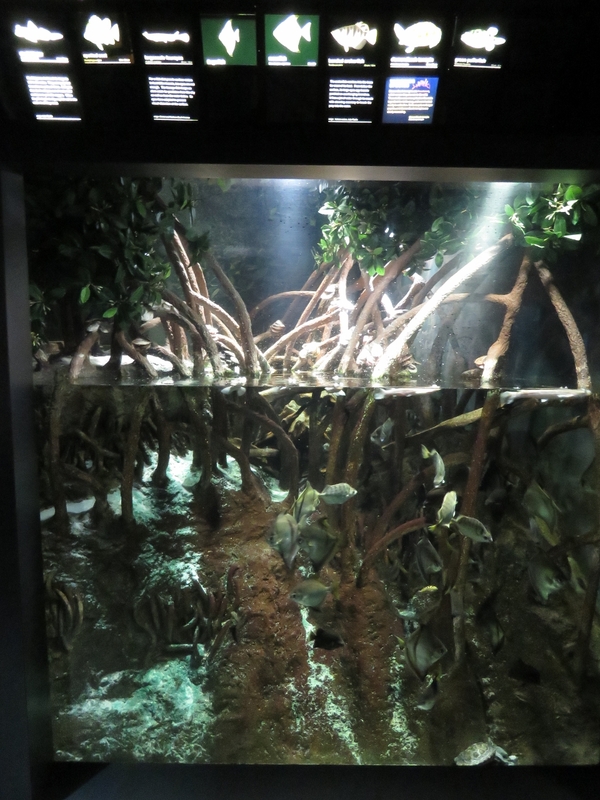 The mangrove exhibit looked much like the mangrove forests we saw in Australia. 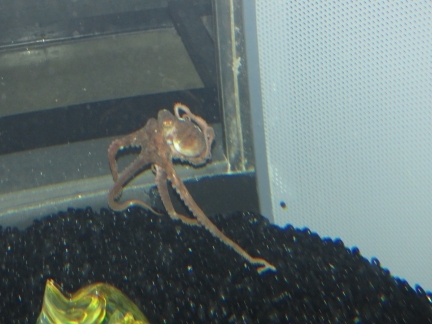 This tiny red octopus was one of three in a tank. 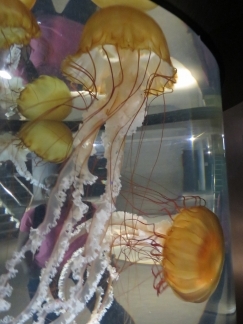 Strung from the tanks were small glass vessels for the octopus to tuck into. 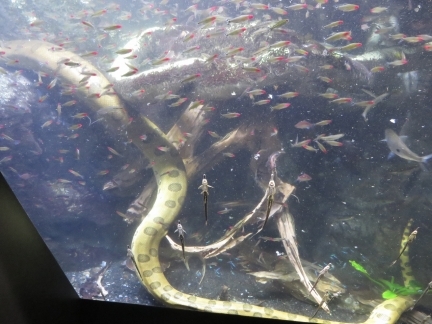 Anacondas are the largest snakes in the world, growing to 30 feet long and weighing more than 500 pounds. 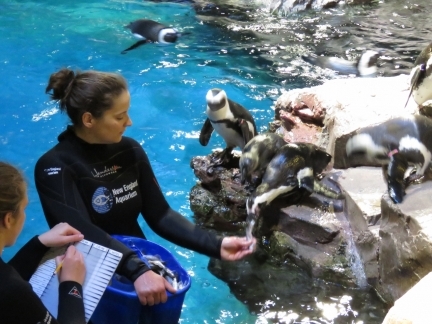 They can eat mammals that weigh up to about 150 pounds. They wrap around their prey and squeeze, tightening each time the animal exhales until it can’t take another breath, then they swallow it whole. This placard describing Australia’s temperate reefs featured beautiful and rugged Wineglass Bay, our first Tasmanian anchorage. 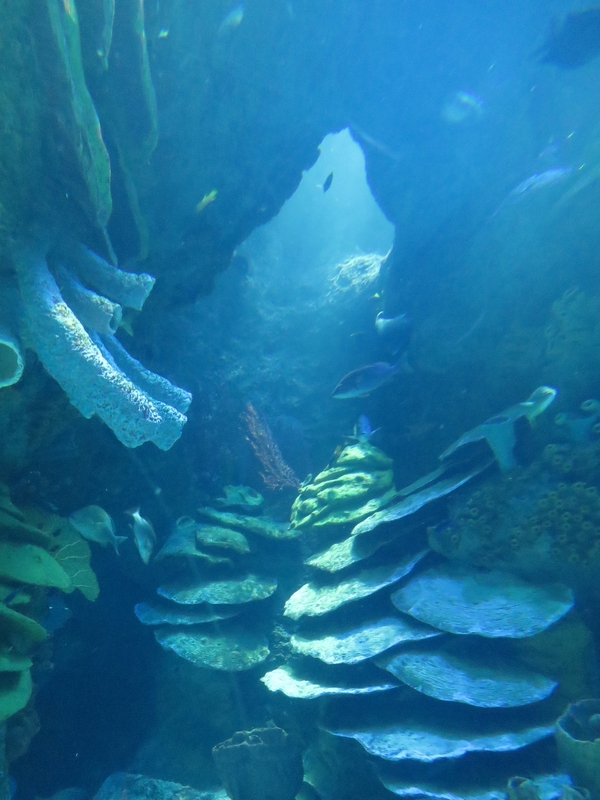 Looking across the top of the Giant Ocean Tank where you can look down into the reef. 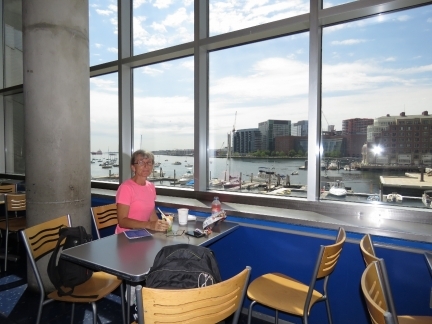 A quick snack at the aquarium’s Harbor View Cafe overlooking India Wharf. 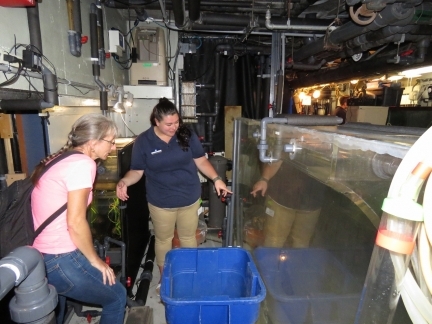 Lorna, our guide on a Behind the Scenes tour of the aquarium, describing how the jelly fish are bred. 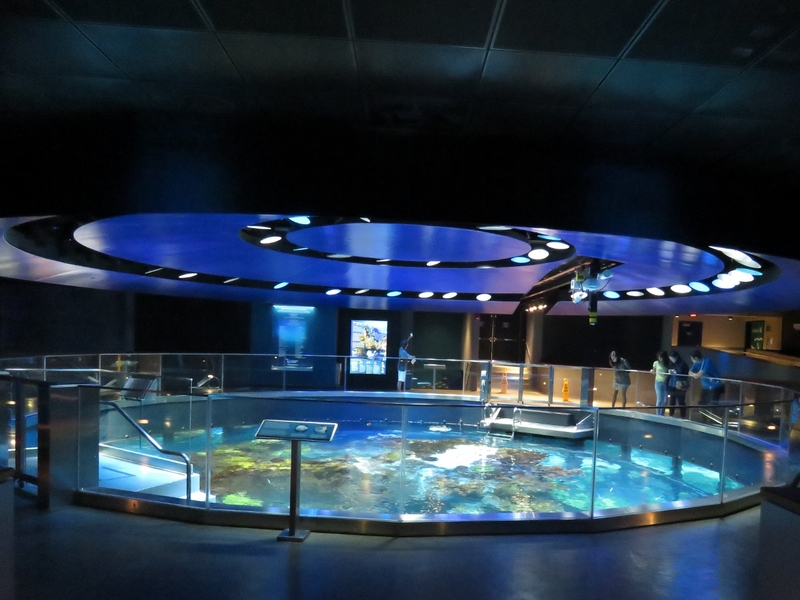 The aquarium galleries are built with service floors a half level above the viewing galleries so that the tops of the tanks are accessible roughly at waist level. 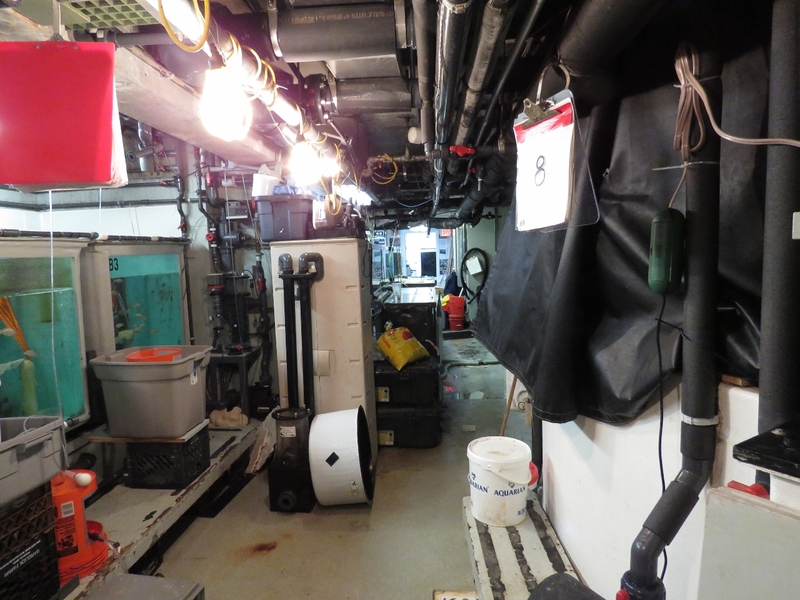 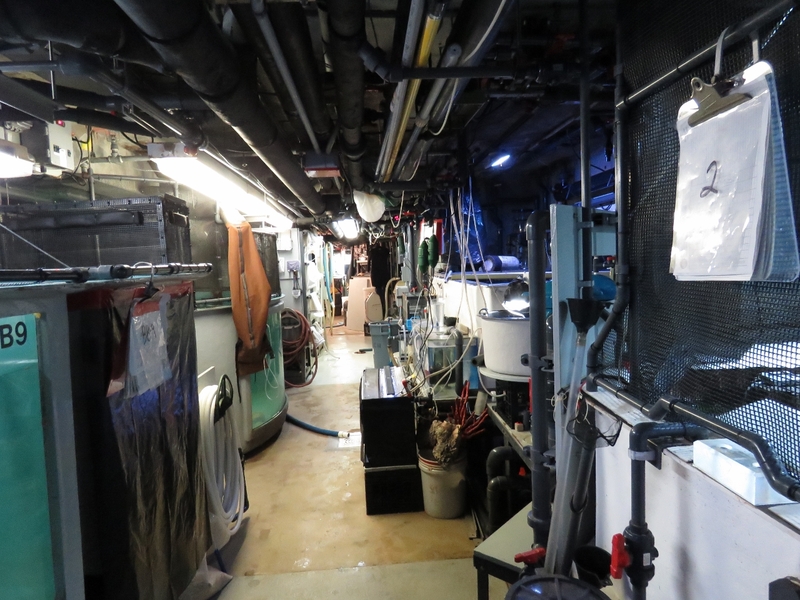 On the right is one of the exhibit tanks and on the left are breeding, research or holding tanks. 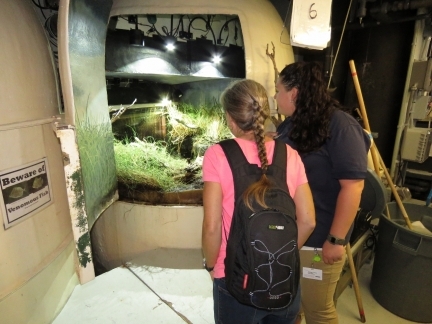 Each time Lorna opened one of the doors, we briefly became part of the exhibit for those looking into the tank from the other side. 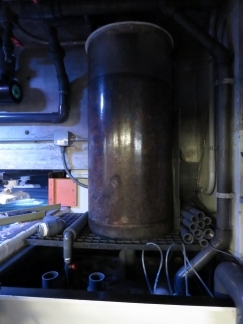 One of the few open tanks we saw from behind. 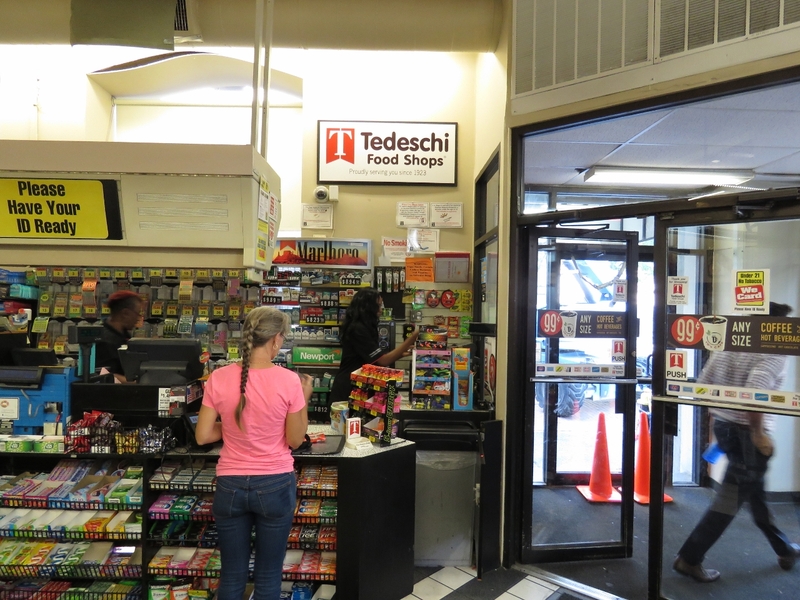 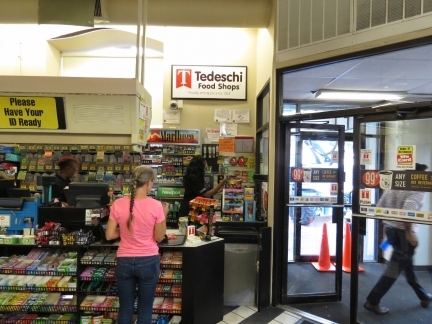 Many exhibits have to be carefully closed and sometimes sealed so their occupants don’t escape. 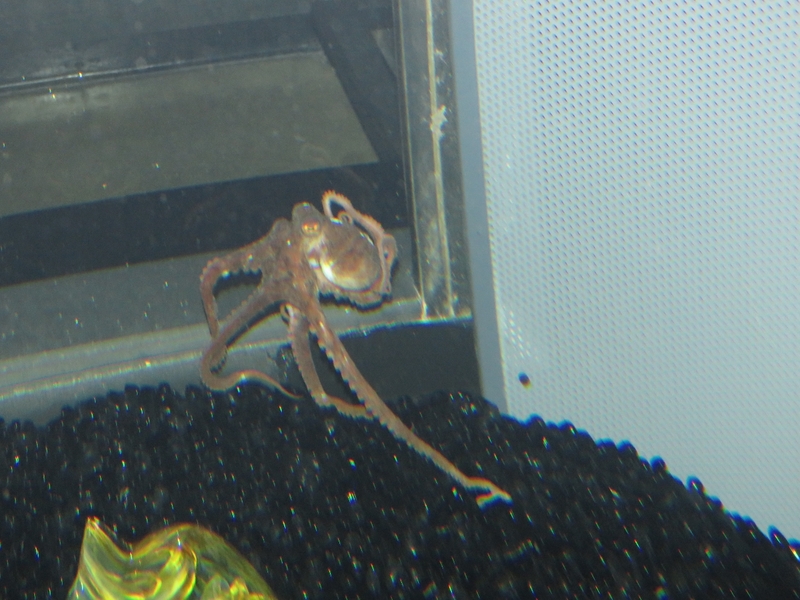 Octopus are particularly adept escape-artists and can fit through anything the size of their beak or larger. 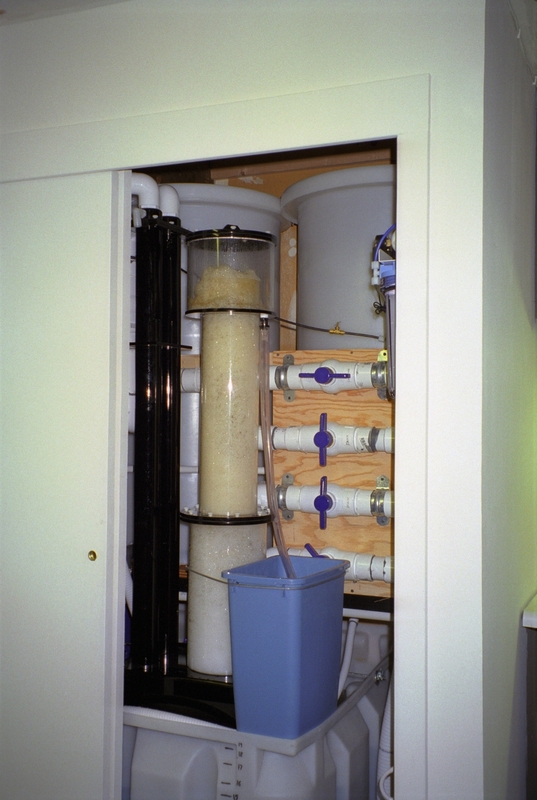 We had a big protein skimmer (a type of water filtration) on our reef tank in Seattle, but this is even larger. 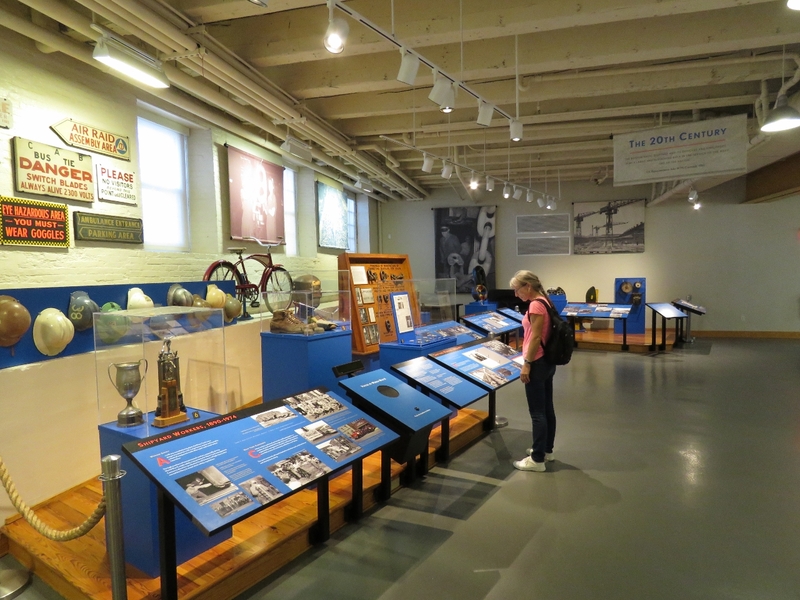 An incredible assortment of equipment is behind the aquarium galleries. 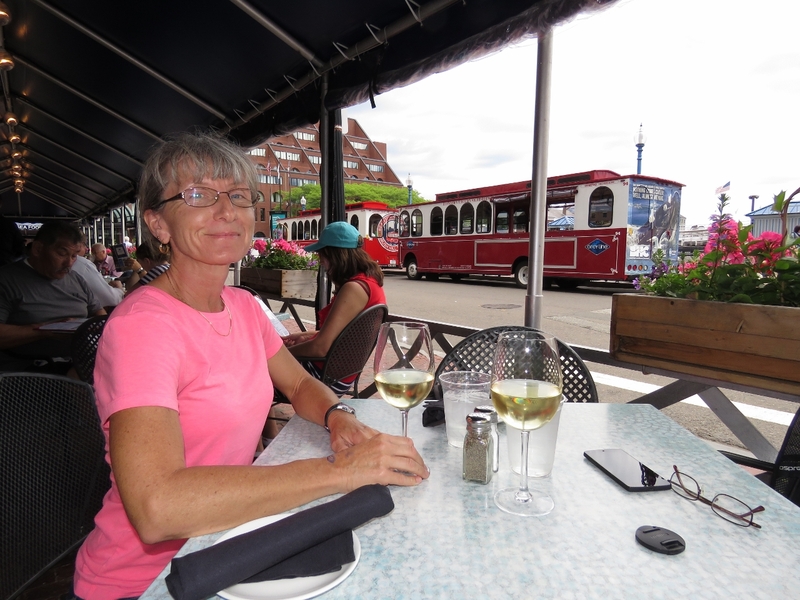 An excellent lunch at Legal Seafood opposite the aquarium. 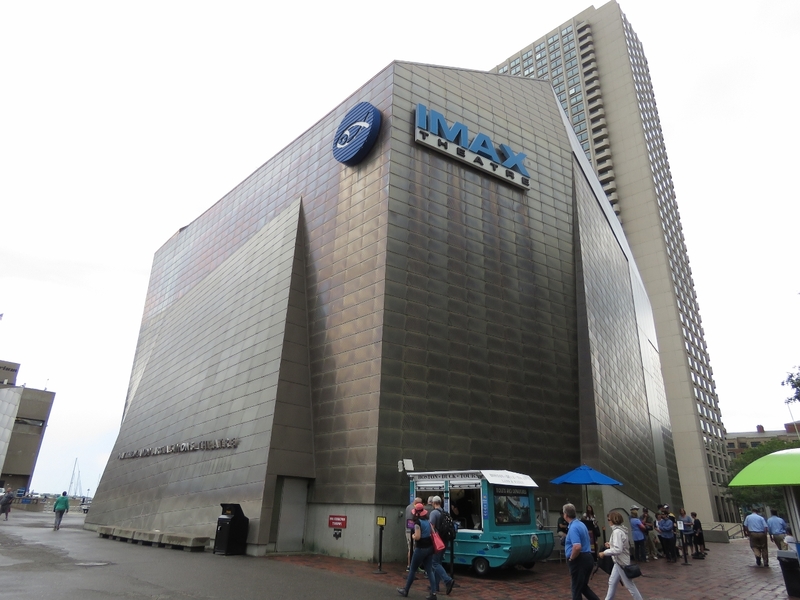 After lunch, we took in a couple of IMAX films: Secret Ocean and Galapagos. 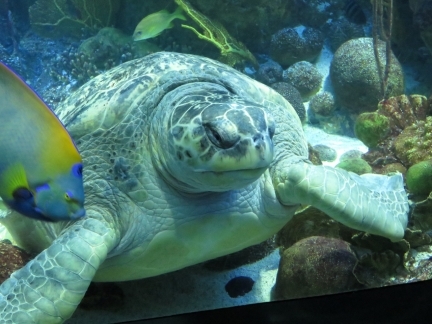 We’d sure love to visit the Galapagos one day–the animal life is just incredible. 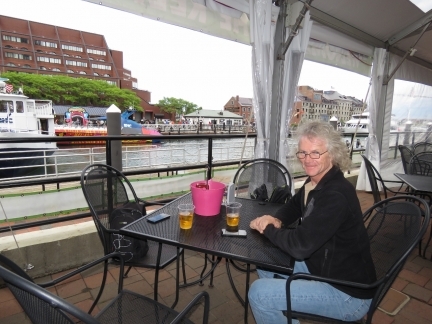 Having a cider at a temporary bar along the harbor walk beside the aquarium before going back in to see the rest of the exhibits. Fish viewing is thirsty business. 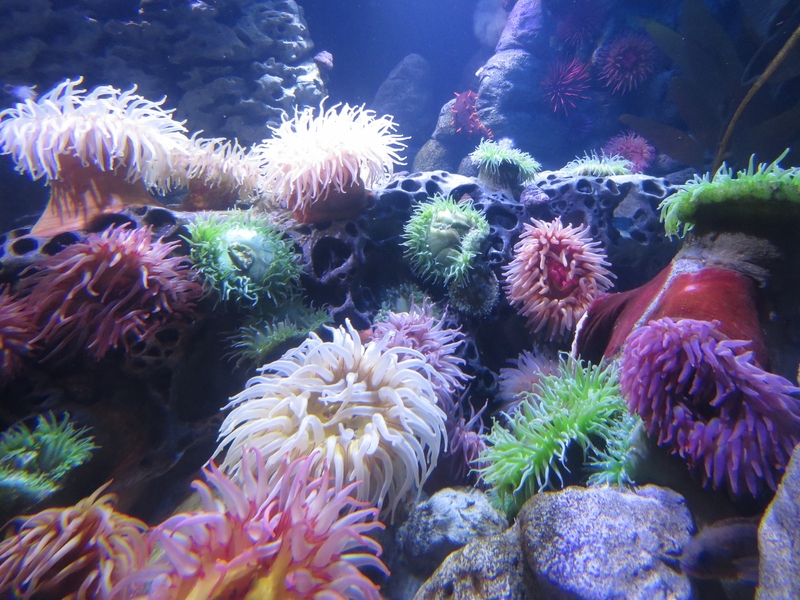 This temperate Olympic Coast exhibit contained many anemones and creatures that we used to see while diving around the Seattle area. 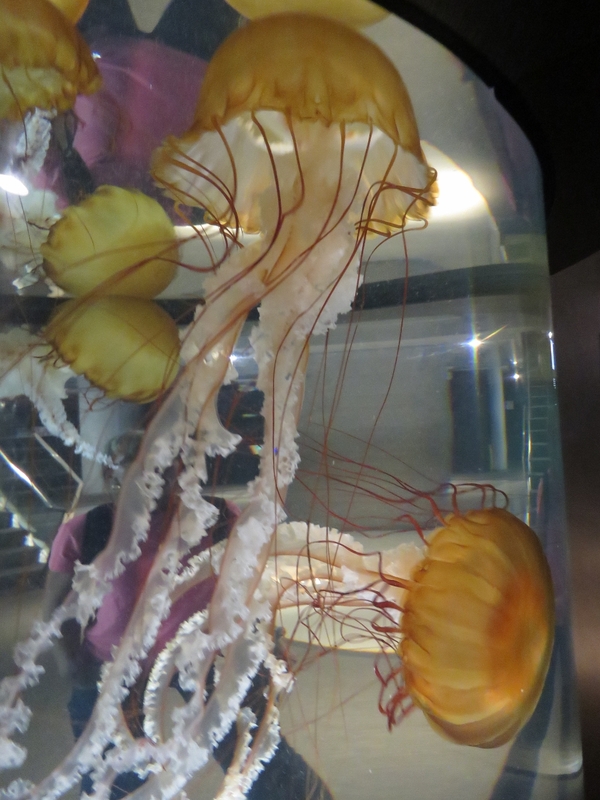 The maroon tentacles of the striking Pacific Sea Nettle can grow to 15ft long. 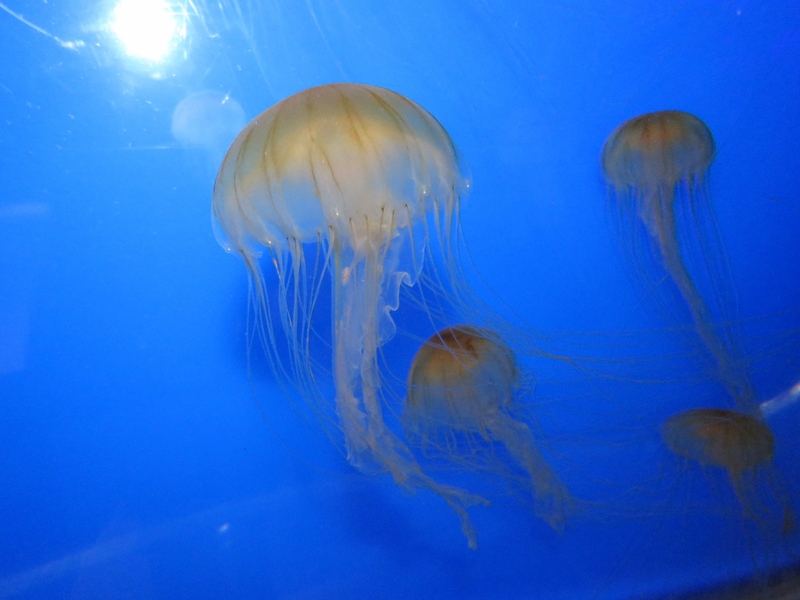 Beautiful South American Sea Nettles. The New England aquarium has a wide assortment of jelly fish on exhibit. Nordhavn 50 Flat Earth on a mooring off downtown Boston. 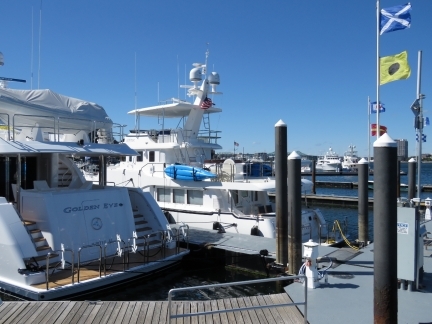 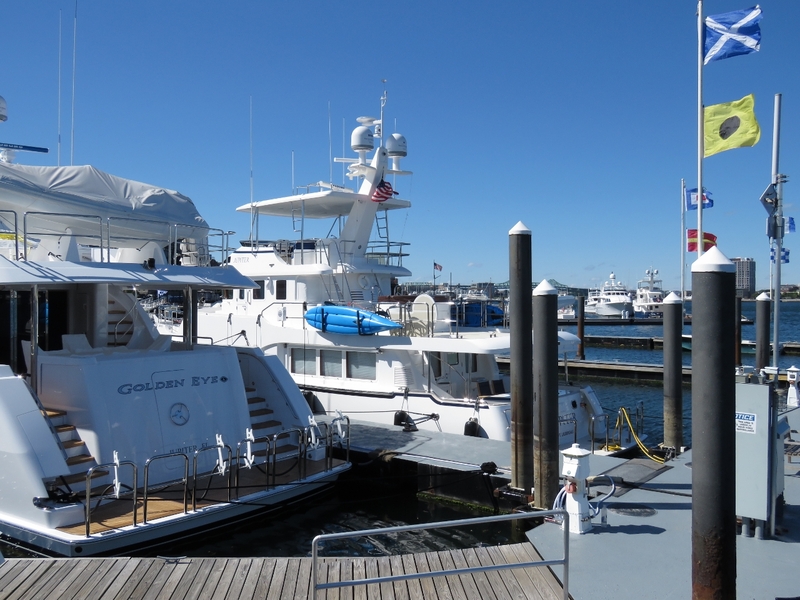 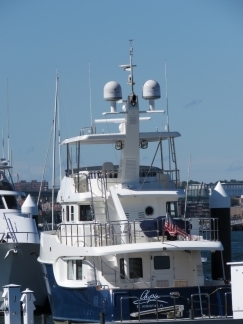 Nordhavn 60 Jupiter at the Boston Waterboat Marina. 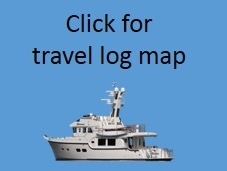 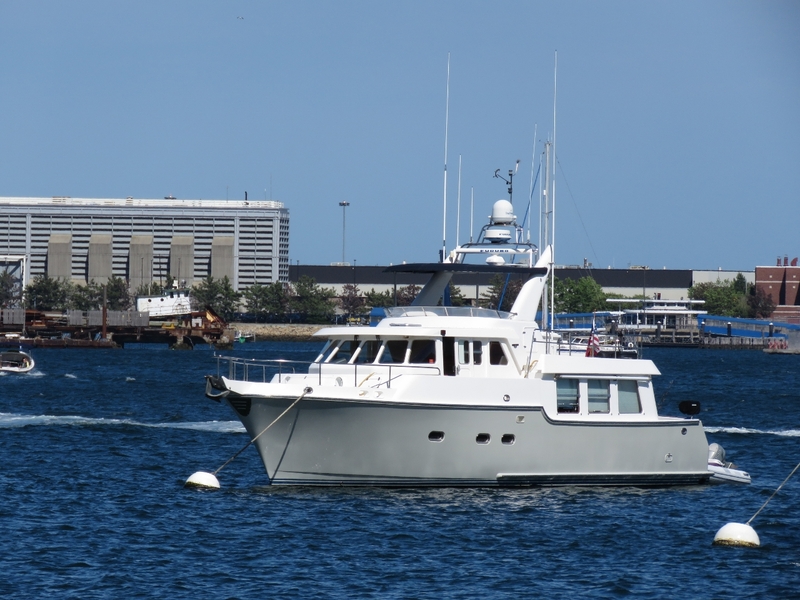 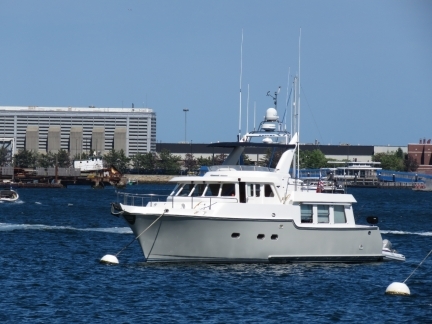 The Nordhavn 60 we saw while coming into Boston. 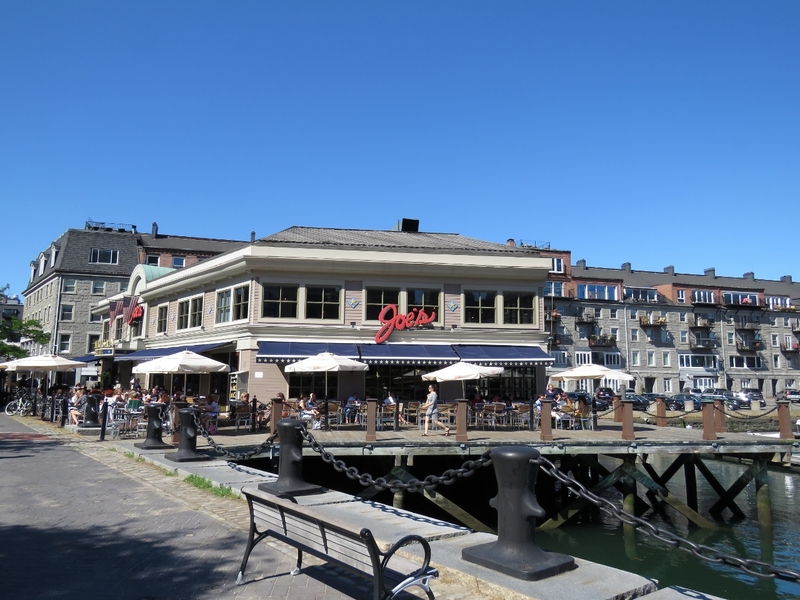 We couldn’t read the name before—its Chopin. We saw several good potential spots for lunch or dinner as we walked along the harborfront back to Dirona. Battery Wharf was named for the gun battery there in the 1640s. 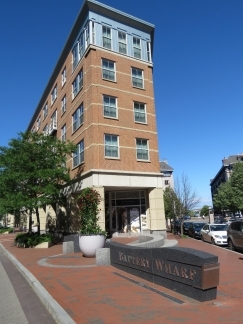 Now it’s home to a luxury hotel and residential development. 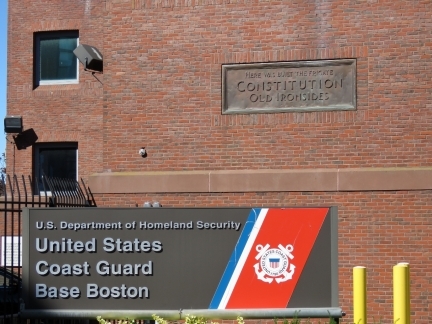 The US Coast Guard Base Boston includes the site of Edmund Hartt’s Boston shipyard where the USS Constitution was built between 1795 and 1797. 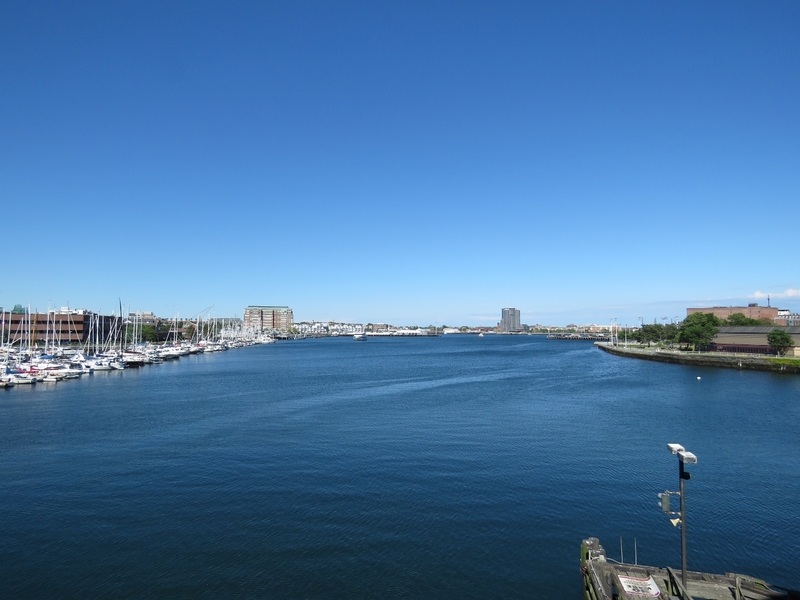 The view looking northeast from the Charlestown Bridge down the Charlestown River. 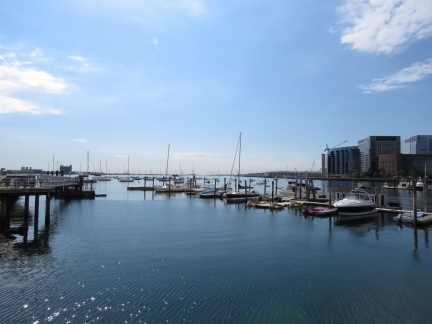 Constitution Marina in on the left. The Charlestown Navy Yard Visitor Center was closed for the day when we first visited, so we stopped in on our way back to Dirona.